MAYSVILLE, Ky., March 19, 2018 /PRNewswire/ -- STOBER Drives, Inc. of Maysville, Ky., has been selected to receive a 2018 Best Places to Work award for the state of Kentucky. See how STOBER grows and develops our talent! 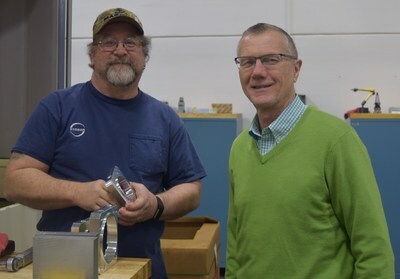 Ernie Hamm, machinist, is shown with Peter Feil, general manager. Low-cost healthcare, education reimbursement, onsite classes, apprenticeships, and employee health and wellness programs that encompass financial and physical fitness are some of the benefits and opportunities offered to STOBER employees. "We want our people to be the best version of themselves," said Peter Feil, vice president and general manager at STOBER. "Giving people the chance to grow and develop has had a positive impact on our corporate culture. Employees trust we want the best for them and aspire to become the best version of themselves. People development, wellness, job creation, and other initiatives offered in-house inspire more people to participate in the process– and more company loyalty. It's a win-win for everyone." Making an investment in people is a great opportunity for employees, but it also benefits the company as a whole, said Feil. "Retention increases, job satisfaction rises, and the company performs at a higher level," he said. "This also creates a 'virtuous cycle' of talent and promotes local initiatives." One of STOBER's core values is to serve others. Having fun is also encouraged. The STOBER activities committee recently came up with the idea of having the STOBER management team smack lips with a pig for a Relay for Life fundraiser, raising $1,500 for the organization. STOBER has also donated thousands of dollars over the years to numerous organizations and causes, including: Maysville Women's Crisis Center; KCTCS Farm and Family Night; Camp Discovery 2017; Bracken County Conservation Day; Lions Club Radio Auction; Lewisburg Lions Club Horse Show; Buffalo Trace Children's Advocacy; and Boy Scouts of America. STOBER believes in nurturing a positive culture among worker families, too. Each year, STOBER hosts a company picnic and Christmas party for employees and their loved ones. An Employee Appreciation Week consisting of one week of fun activities, free food and raffles is also popular. STOBER even has a talent development leader whose only job is to help employees grow and thrive. "When we hire a person, we don't look at who they are now, but who they can be in five or 10 years and how they can help themselves and our company," said Feil. "People development is a core aspect of our company and any rural area in America that wants to thrive needs to offer opportunities for its people. It's important that STOBER invests heavily in people, so we're leading by example to have others in the community invest in young people, retain young people and allow the community to continue to thrive." STOBER specializes in quiet, efficient, and durable gearboxes. Established in 1991, STOBER is a U.S. company with an 80-plus year German heritage. It has two unique lines in motion control and power transmission, and has expanded into the global market for a wide variety of applications including robotics, material handling, packaging, food and beverage, machine tool, medical equipment, semiconductor manufacturing, aerospace equipment, printing, and general automation application. For more information about STOBER helical gearing, visit www.stober.com or contact the company at (888) 786-2371. Established in 1991, STOBER™ Drives, Inc. is a U.S. company with an 80-plus year German heritage. STOBER specializes in quiet, efficient, and durable gearboxes. With two unique lines in motion control and power transmission, STOBER has expanded into the global market for a wide variety of applications including robotics, material handling, packaging, food and beverage, machine tool, medical equipment, semiconductor manufacturing, aerospace equipment, printing, and general automation application. With excellent customer support, extended warranties, one-day delivery, and exceptional products, STOBER is "geared to a higher standard!"